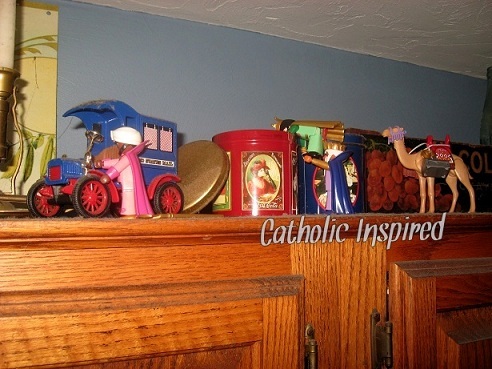 Today we found the wisemen searching through the knick-knacks above my kitchen cabinets. This one was hard for the kids to find since the kings blended in with the stuff so well! That made it interesting! Balthazar and Melchior have teamed up to look inside of the tin cans. But Caspar has his eye on that fun little antique car! Good thing we hid the keys, or he might have taken it for a spin! 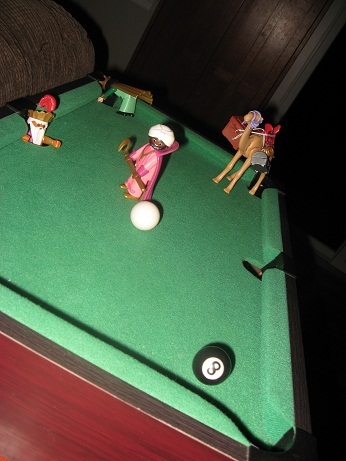 While looking for baby Jesus in our mini pool table, Caspar was still having a grand time! Balthazar and Melchior are likely to get hit with a ball as Caspar makes a shot! Ah yes, the junk drawer! We all seem to have one! 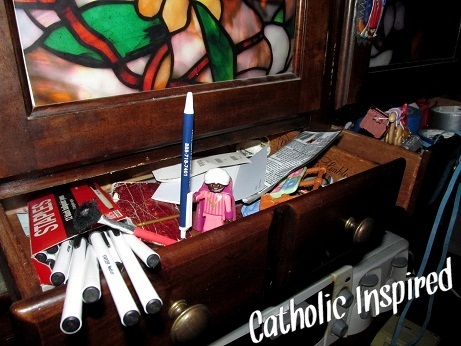 It's the drawer that holds all the little broken things that need fixed and other stray items that need a home. 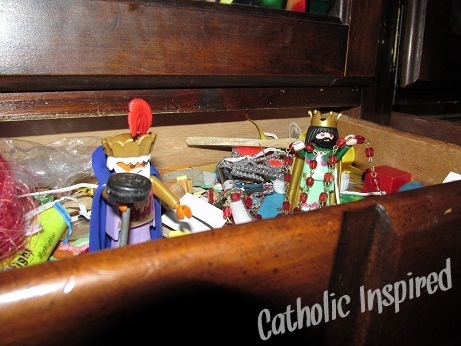 Balthazar and Melchior are digging through ours looking to find the infant King. Caspar seems distracted by the idea of finding a new staff. No luck again, maybe tomorrow will be better! Bloggers, make plans to join us next year! I hope to host a link-up! Blessings! Pinterest and Broken Pins.... Feel free to pin! Nativity Cupcakes for Christmas Parties! The Wisemen have finally found Jesus! Lots of Epiphany Crafts and Ideas! !